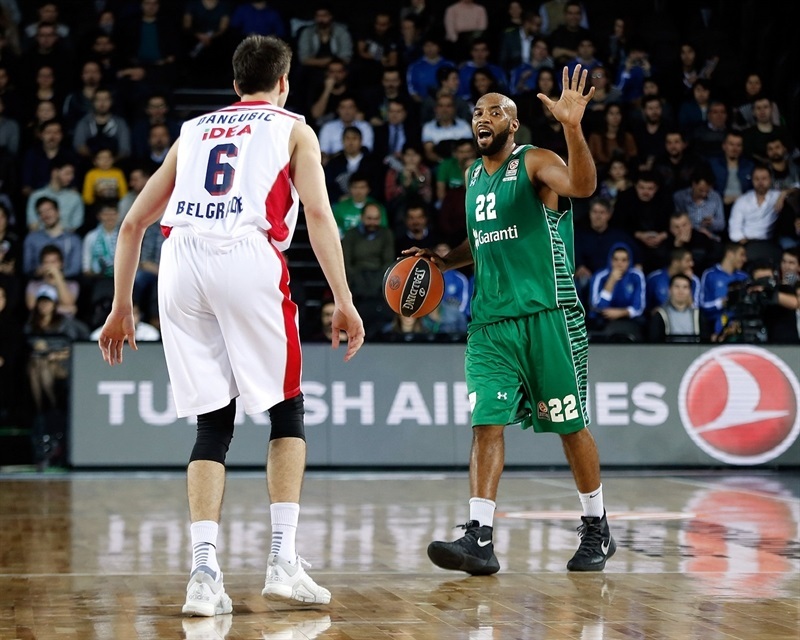 There are no more winless teams in the Top 16 this season after Darussafaka Dogus Istanbul made a bit of history, pulling out a hard-fought and dramatic 69-66 win over visiting Crvena Zvezda Telekom Belgrade on Thursday night. 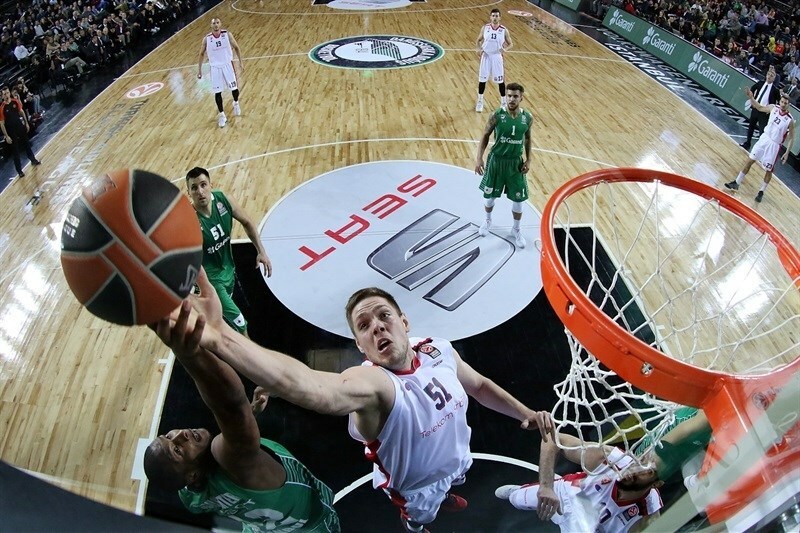 It was the first ever Top 16 win for Darussafaka, which improved to 1-5 in Group E, while Zvezda dropped to 3-3. Neither team held a lead bigger than 6 points during the game and there were nine ties in the second half alone. With the game going down to the wire, the hosts kept Zvezda scoreless for the final 4:27. During that final span, the only baskets were Marcus Slaughter’s put-back and an Ender Arslan triple, which turned out to be a game-winner with 65 seconds to go. 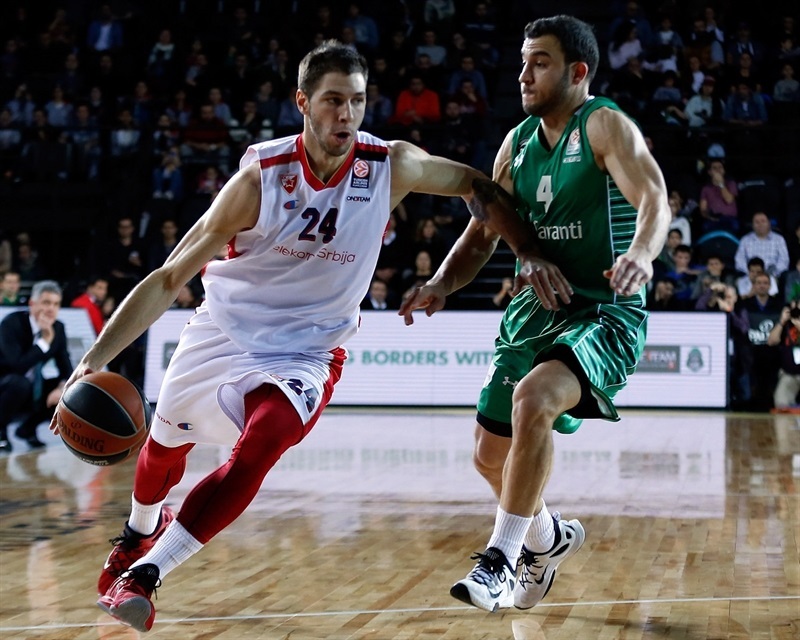 Semih Erden paced the hosts with 14 points and 6 rebounds. 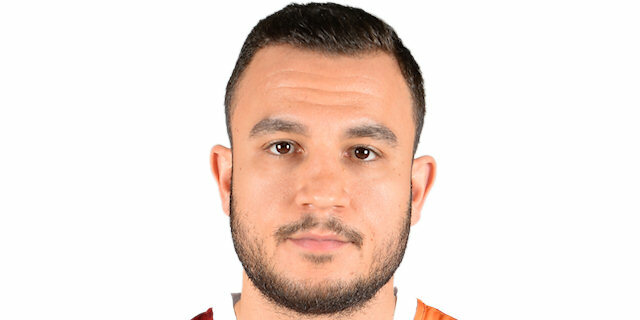 Mehmet Yagmur scored all 10 of his points in the first quarter, and Arslan also finished with 10 in victory. 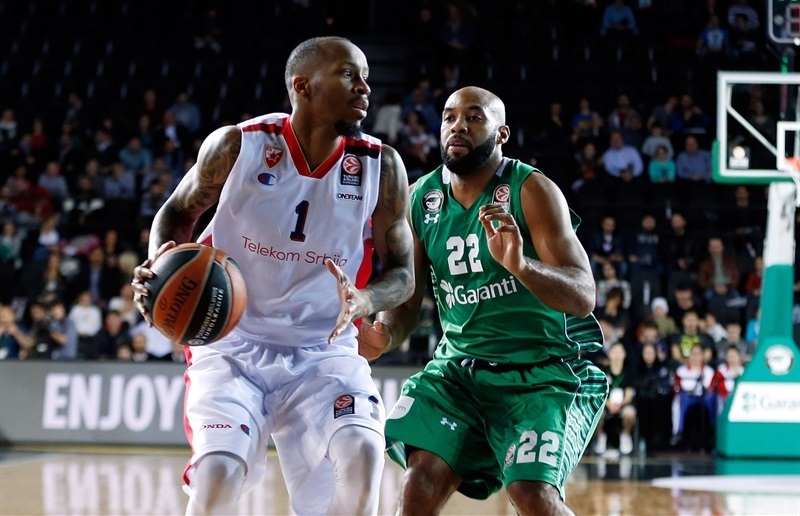 Jamon Gordon contributed with 8 points, 7 rebounds and 3 assists in Darussafaka’s historic night. Tarance Kinsey paced the visitors with 16 points, and Vladimir Stimac collected 11 points and 10 rebounds. 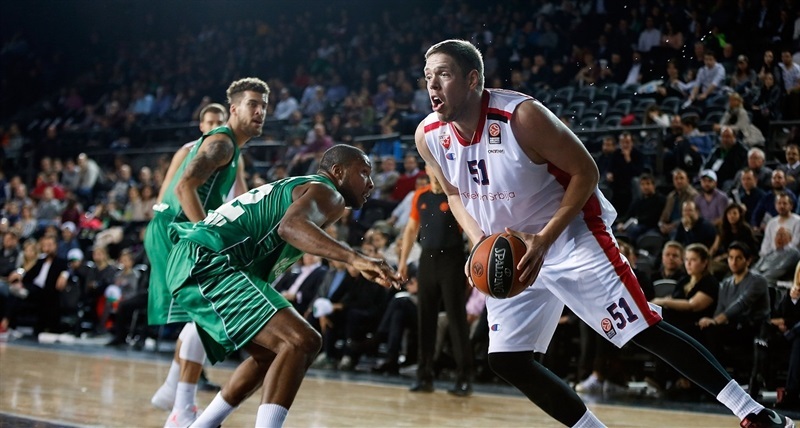 Maik Zirbes had 8 points and 6 boards in the losing effort. 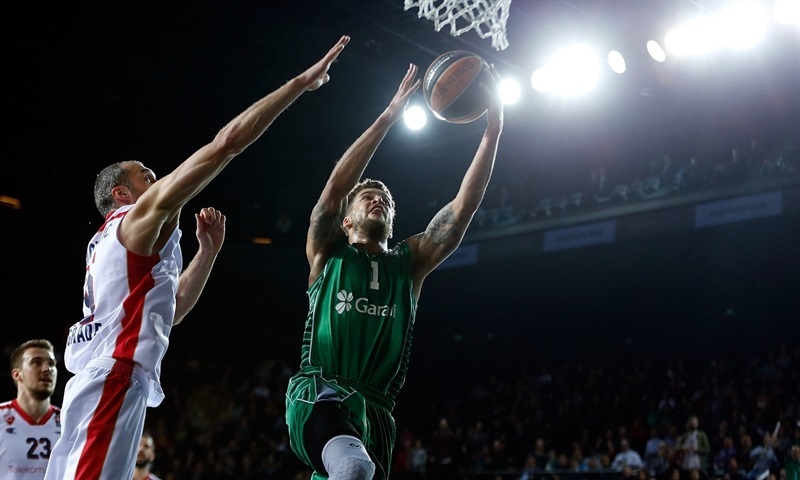 Quincy Miller opened the scoring with a second-chance slam and after Erden split free throws for Darussafaka, Zirbes fed Nemanja Dangubic for an easy layup. A jumper from Stefan Jovic made it 2-6. Gordon scored a driving layup to help tie it at 6-6 before Zirbes had a tip-in and Kinsey nailed a jumper as all of Zvezda starters had scored already. Dangubic’s smooth jumper opened a 6-12 advantage. 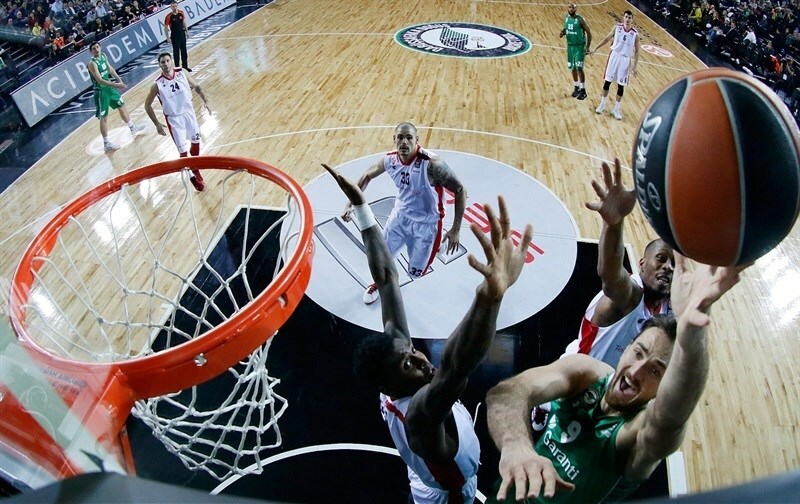 Erden had a dunk for the hosts and Yagmur hit a triple – the first of the game for either team. Kinsey hit two more mid-range jumpers for the visitors, with Bjelica scoring a layup in between for Darussafaka. Miller got a shooter’s roll on a three-pointer to open a 13-19 lead with 3:10 left in the quarter, but Yagmur banked in a runner, then nailed a triple in transition to quickly get the hosts within 18-19. Yagmur did not stop there, knocking down a long baseline jumper to put Darussafaka in front, helping the hosts end he quarter on an 8-0 run and hold a 21-19 lead after 10 minutes. 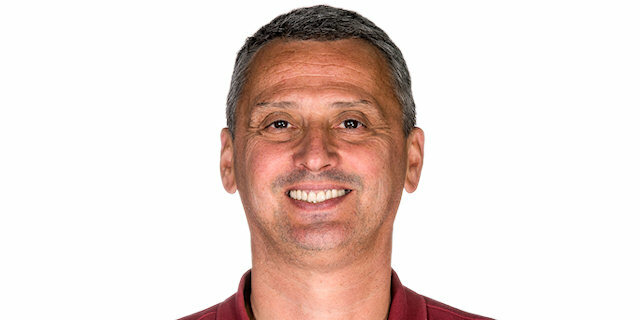 Bjelica scored inside for the hosts, but Stimac scored from close range, Marko Simonovic from long range for Zvezda, before Vasilije Micic fed Stimac with a nifty bounce pass to give Zvezda a 23-26 lead. Harangody hit a mid-range shot, before Micic and Reggie Redding traded triples. Slashing to the basket, Gordon tied at 30-30. 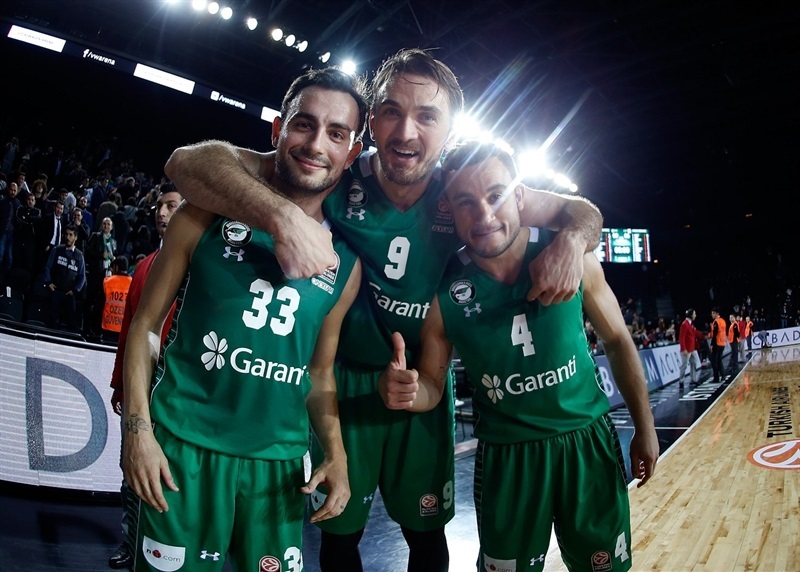 Jovic hit a jumper for the visitors, but Arslan bettered it with a triple before Erden scored from close range to give Darussafaka a 36-34 advantage. Zvezda tied it again with Jovic dishing on a breakaway for Dangubic, but Erden answered inside and Gordon beat the halftime buzzer with a driving layup to make it 41-37 at the break. Zirbes got the third quarter going with a basket inside. Erden had a tip-in-plus-foul to open a 44-39 lead, but Jovic had a driving layup, Kinsey nailed a triple and Jovic fed Zirbes for a dunk that helped Zvezda take a 3-point advantage. Bjelica snapped a 0-8 run from the free throw line, before Stimac and Erden traded basket inside to tied it, 50-50. Stimac scored inside and Kinsey made a short jumper, but Scottie Wilbekin, Arslan and Bjelica went 5 of 7 from the free throws line to give Darussafaka a 55-54 edge after 30 minutes. Slaughter and Marko Guduric each made a pair of free throws, and Stimac fought to convert a loose ball into a basket. Branko Lazic hit a baseline jumper, but Arslan made foul shots to spark a little run by the hosts; Harangody scored inside and Wilbekin finished a fast break with a layup to make it 63-60. After a Zvezda timeout, Simonovic buried a three and Jovic found Zirbes with a pass for a dunk that made it 64-66 with 4:27 left in the quarter. Neither team scored for the next two minutes until Slaughter’s put-back tied the game for the ninth time in the second half, 66-66. 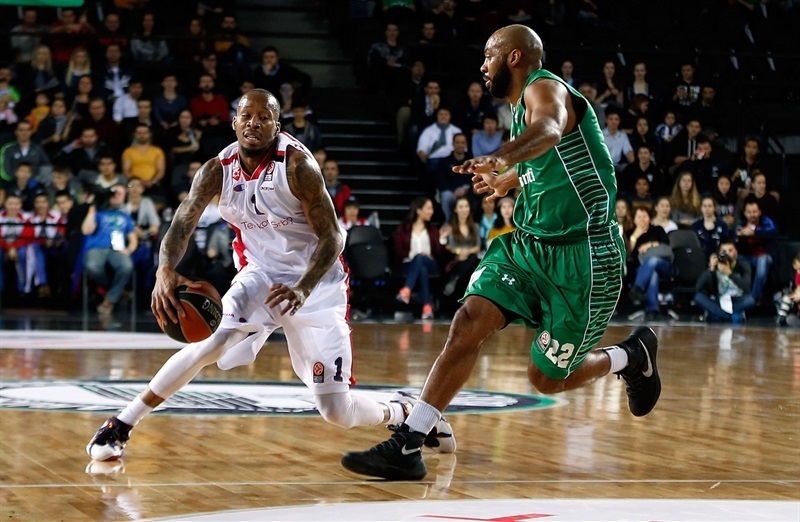 Zirbes missed both free throws for Zvezda with 90 seconds to go, and Darussafaka grabbed 2 offensive boards on the next trip down the floor before Arslan buried a triple to give the hosts a 69-66 lead going into the final minute. 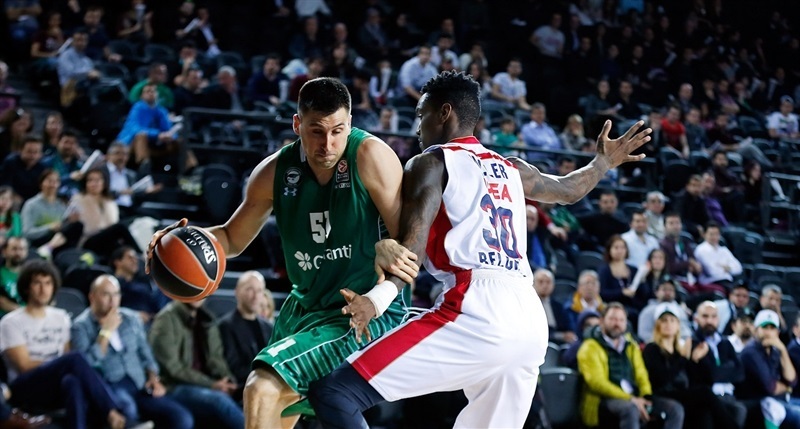 The visitors held the ball for the final 33 seconds, and had two three-point shots in the last 10 seconds of the game, but Lazic and Jovic misfired and Darussafaka held on for its premier Top 16 win. "It was very important game for both teams. We’re trying to stay alive after five losses. During our last five or games in the Turkish League or Euroleague, we lost in the last 20 seconds against Panathinaikos, Fenerbahce and Anadolu Efes. So we found pressure on us. This was obvious in our free throws. In the first half we fought very well. In the second half Crvena Zvezvda became more aggressive. In the fourth quarter there was an equal game. At the end we deserved this victory." 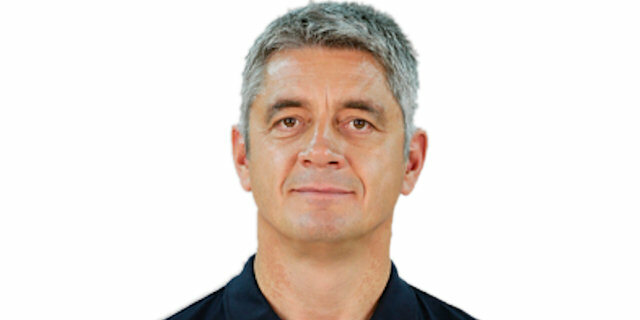 "Before the game we knew that Darussafaka would give everything to win. In the first half we weren’t good as I had expected. In the second half we were much better defensively. We had problems with personal fouls and we had to find other solutions on offense. At the end of the game, Darussafaka was much better. In the final minute we gave away 2 offensive rebounds, missed 2 free throws and we missed that shot that might tie the game. These situations were crucial for us." "It’s a good win for us. We lost a couple of games in the dying minutes. This time we won in the final minute. That win will bring up our self-confidence. Now we need a kind of miracle to qualify to the playoffs. But we will fight until the very last game. We managed to answer their aggressiveness by being equally aggressive on the court as I said two days before the game. Personally, I’m trying to be helpful as possible to my team."